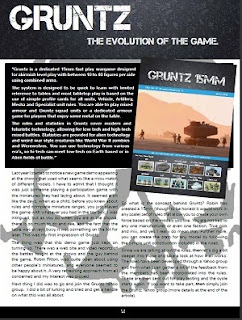 This Months release of the PDF SCI-FI and Fantasy magazine The Ancible features an article about me and my motivations for gaming, an independent review of the Gruntz game and a Battle Report (AAR) of a game of Gruntz between myself and my son Oscar. I must admit the game was a small one because I was short on time with the build up to Salute, it does however cover most of the mechanics and flow of the game. 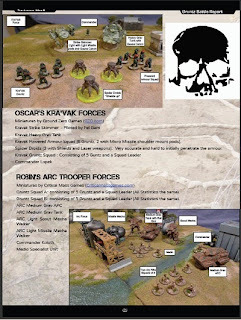 It is issue 8 of Ancible which is a free download from this list here http://www.the-ancible.com/Downloads/The_Ancible_Issue08.pdf There are several other great articles on small scale 6mm and 15mm Science Fiction gaming, including Future War Commander and Critical Mass games. It is a great read with a lot of high quality terrain photos and model images. There are also two photos of me in the articles, so you can see exactly how ugly I am! 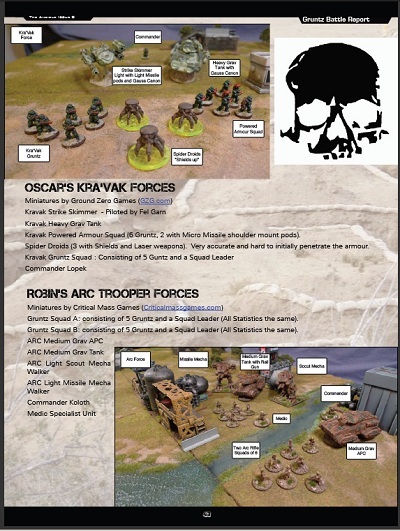 Here are a couple of reductions of the pages in the magazine showing the battle report and intro. Excellent! Thanks for posting this. I will check this out.